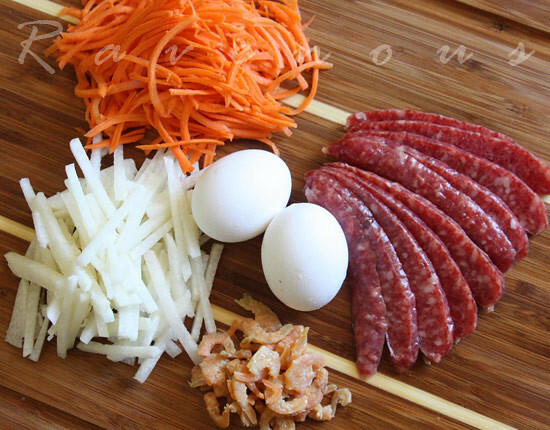 Bo Bia is a common street food in Vietnam made made of chinese sausage, jicama, carrots, dried shrimp, and slivers of thinly scrambled egg. Although the word “bo” means beef, there is no beef in this whatsoever. 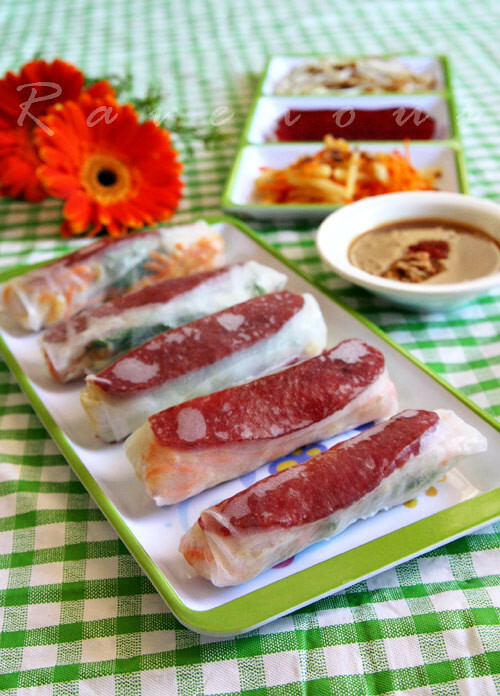 The dish and name likely derived from Chinese Teochow immigrants in Vietnam who had a similar dish called “Popiah” pronounced “Bo-BEE-a” The Chinese version however is made with a thin wheat crepe, but being in Vietnam, the Chinese immigrants quickly adapted the rice paper to their tradtional dish. The stuffing however can be diverse and include other items such as tofu, bean sprouts, and lettuce. The traditional dipping sauce is typically hoisin based. 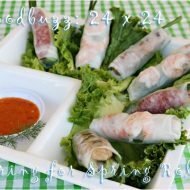 We served these at our 24×24 Spring for Spring Roll Party and it was a nice variation to you typical spring roll. For a vegetarian version, try substituting the chinese sausage for strips of sauteed tofu and eggs for shitake mushrooms. Bo bia…pretty elegant street food wouldn’t you say? For Peanut Sauce: In medium sauce pan, lightly add oil and sautee garlic, shallots, ginger until fragrant and mix together equal portions of peanut butter and hoison sauce under low heat. Slowly mix in hot water--a few tablespoons at a time and stir to incorporate and thin out the sauce to your desired consistency. You can always adjust this sauce to your taste--if you like sauce more hoison or peanut flavor, add bigger portion of each respectively. Season with any additional salt to taste. Just before serving add crush roasted peanuts and optional chili. Store in airtight container, lasts about 2 weeks in the fridge. For Bo Bia: Heat oven to 200 degrees. Place the cut sausages in on foil lined cookie pan and place in oven for about 10-15 minutes. You just want the sausages to just turn golden red and fat to melt--set aside to cool. Scramble the eggs and season lightly with salt and pepper. In large nonstick saute pan with small amount of cooking oil add the scrambled eggs and make a very thin paper like omelet. Make several batches if necesssary. No need to flip. Remove when it is golden yellow and allow to cool. Then julienne into then strips and set aside. In same pan, on medium low, heat a small amount of cooking oil and saute the carrots, jicama, shrimp and season with fish sauce and pepper to taste. Cook until carrots and jicama are just barely wilted. Remove and set aside. Now you have everything you need to assemble your bo bia. Dip rice paper in lukewarm water and when soft and pliable, add your veggie mixture, eggs, and finally your sausage and roll. 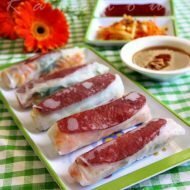 This is quite a protein packed spring roll. I'm sure it's very filling. I've never thought to slice the sausages and cook them in the oven, but I really like the way they look in this post. It really is an elegant street food. christine: slicing the sausages lengthwise makes for a prettier presentation. Ju: we should have consulted you before writing this up..thanks for the info! They're beautiful! I think my mom makes the Chinese version with flour wraps, but then you can't see the inside like with these rice wraps. Bo Bia is so the red headed step child of all the spring rolls. But the Chinese sausage with peanut sauce is so so so good! Jess, Bao, Anne: many times when people make this, they cut the sausage into small circles–it gets lost among the jicama, carrots, and eggs. 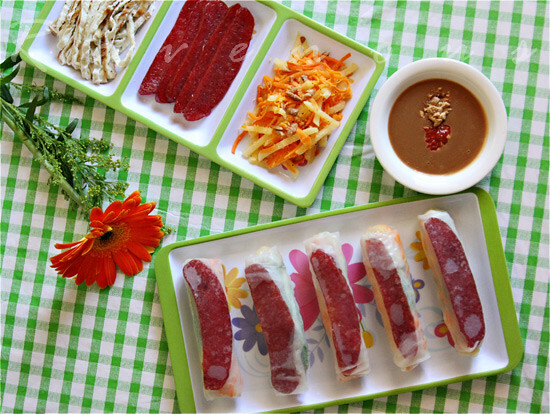 To us, the chinese sausage is the star so definite get the best quality brand you can find. Oh wow! Thanks for this post!! 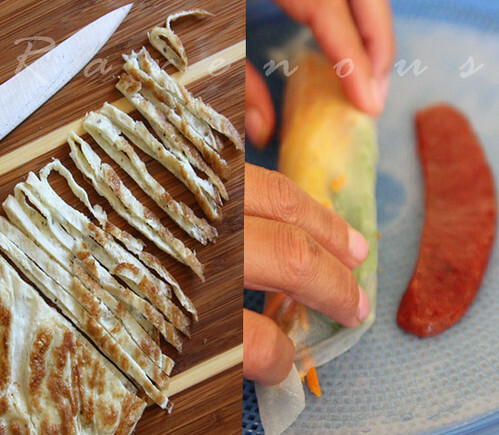 I ADORE popiah…I was just reminiscing about it the other day, wondering if I can make my own at home. I miss it so much! But I notice that the skin is different…wondering if I can get the real popiah skin anywhere? I live in LA, too. Hi! When I saw Bo Bia, I thot it was a dish new to me and then I realized it is Popiah – the way I spell it!! Love this! I tried making the skin though unsuccessfully But agreed, this is super yummy. Looks delicious and perfect for the weather right now. I love love LOVE traditional bo-biah (or however you spell it!). The Taiwanese version uses cilantro, peanuts, pork, pickled vegetable, and bean sprouts. 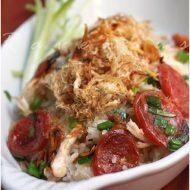 I always love seeing how Vietnamese food is similar, yet so different and unique in it's own way, compared to Chinese food. Where can i get the Chinese sausage (name/brand)? I've only seen the smaller sausage and the ones shown here looks a lot bigger. @mai: we use the California brand thats found here in LA and OC. We also cut these lengthwise, so it looks bigger. we don't know where you live but there are lots of brands out there. Hi, great recipes. 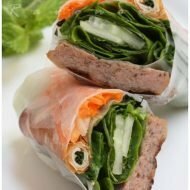 I have been trying to find a similar recipe to the Brodards salad roll dipping sauce, will you please post it?